The earthquake that struck Italy’s Lazio Region on 24 August 2016 caused widespread devastation. Natural disasters can strike anywhere, with little or no warning, and devastate entire communities. The earthquake that hit central Italy last week and the flooding that affected the former Yugoslav Republic of Macedonia last month are 2 examples of the kinds of natural disasters that can occur in the WHO European Region. According to data from the Centre for Research on the Epidemiology of Disasters (CRED) International Disaster Database, between 1990 and 2015 there were over 1300 natural disasters in the Region. These affected over 30 million people and killed over 150 000. Earthquakes, flooding and heat waves have both immediate and long-term impacts on people’s lives and health. WHO/Europe provides support to affected countries during the emergency, the relief phase and throughout the longer-term recovery process. In this second of a series of features on humanitarian response – to events such as floods, earthquakes, heat waves, nuclear accidents and armed conflicts – we look at WHO/Europe’s work related to preparing for and responding to natural disasters. The new Health Emergencies Programme enables WHO/Europe to better support countries in building their capacity to manage risks from health emergencies caused by all hazards, including natural disasters. When national capacities are overstretched, WHO/Europe can coordinate the international health response to provide relief and recovery to the affected people. “Our enhanced operational role means we can be there when countries need assistance in disaster response. We can deliver medical supplies and other equipment, provide technical guidance and public health advice, and quickly mobilize our existing infrastructure at the country, regional and global levels”, said Dr Nedret Emiroglu, Director of the Division of Communicable Diseases and Health Security at WHO/Europe. The new Health Emergencies Programme ensures a coordinated response to people at risk of, or affected by, health emergencies through a common structure across the Region: a single budget and planning mechanism, a single workforce using common standards and processes, and clearly defined accountabilities. It builds on WHO/Europe’s solid expertise and experience in responding to humanitarian crises in the Region, including action on the ground. assessing needs following the disaster. 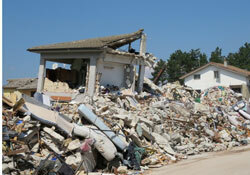 The groundwork for emergency response must be laid well before disaster strikes. WHO/Europe works with countries on preparedness for natural disasters within the framework of the International Health Regulations, and collaborates within the Sendai Framework for Disaster Risk Reduction. One core element of this work is ensuring that health services, including hospitals, are prepared and able to respond in the event of a disaster or crisis. Over the last 2 years, approximately 70 hospitals in the Region have been assessed using WHO’s revised Hospital Safety Index. Uzbekistan was among the first countries in the world to undergo this assessment in June 2015. The Republic of Moldova is applying the revised tool to all of their 68 public hospitals to compare progress since their first assessment with an earlier version in 2010. Following the assessments, each hospital receives detailed recommendations on, for example, improving the safety of structures and infrastructures, and emergency preparedness training for key staff. WHO provides technical support to develop and implement necessary action plans. This year, 9 countries in the Region will receive training in the application of this tool. WHO/Europe is committed to implementing the new Health Emergencies Programme, and will work with Member States to prepare for and respond to health emergencies caused by all hazards. This will help ensure effective, efficient and timely action during natural disasters, so that lives are saved and suffering is reduced. An informal consultation on the Health Emergencies Programme will take place prior to the 66th session of the WHO Regional Committee for Europe.